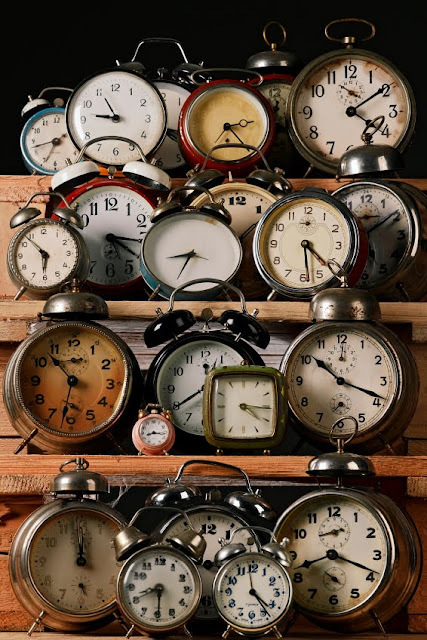 While the weather is deciding what it's going to do for the next few weeks, it's a great time to make plans and decisions about changes you want to make in the Spring. Our "Make a Plan, Work the Plan" consultation service has been very helpful to many of you as you develop plans for your home. 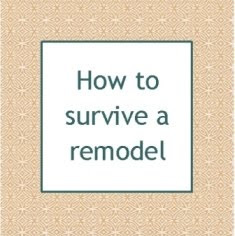 It's a great way to get the ball rolling and avoid costly mistakes along the way. Email Sally for all the details! 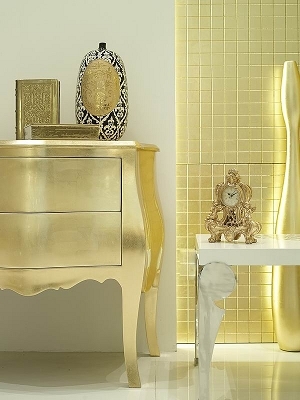 The first part of the year is full of trend predicting, and the Dallas design market show was bursting with ideas, new color palettes and interesting design elements. I thought it would be fun to introduce some of the trends that I'm seeing in the market place to you in a monthly feature. Trends come and trends go. The pendulum in design tends to swing pretty dramatically, and it's a challenge to keep up with what's new. I'm going to use this space each month to showcase a trend that I'm seeing in the design world. 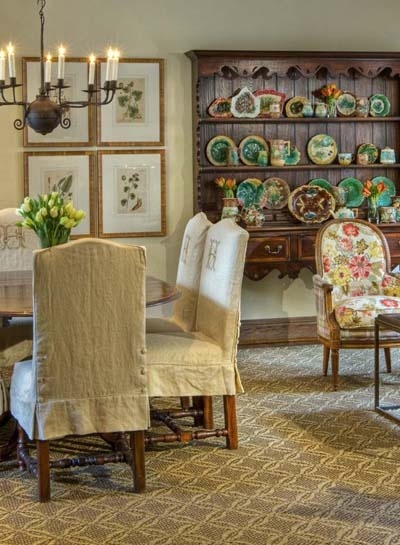 While few of us go headlong into a new trend, there are ways we can incorporate elements that are new into our more traditional styling and keep things looking fresh. Keep scrolling to see a few examples of ways to incorporate this month's trend into your home! Preview! 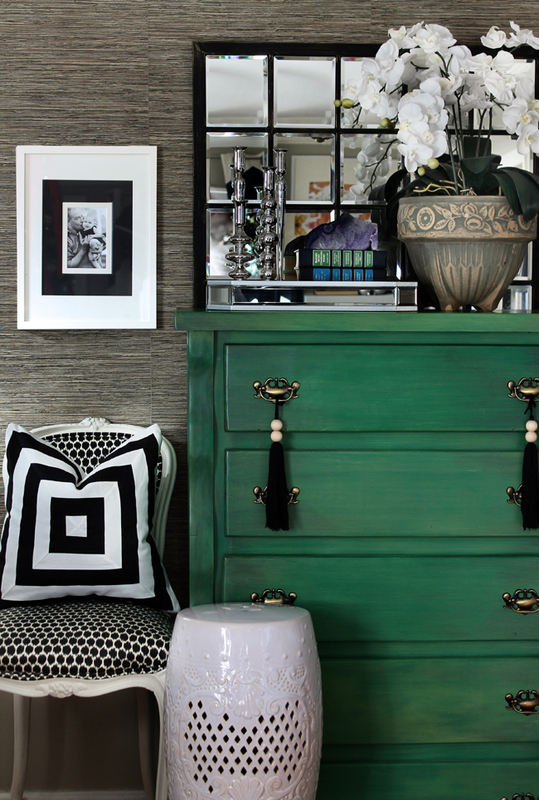 Next month we'll feature the new trend in color for 2014 : PASTELS! Need some great ideas for Valentine's Day? 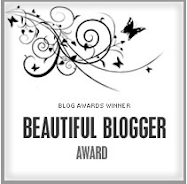 Check out my Pinterest board for lots of cool pins for making the day really special for those you love! Are there special things that you love to see in mass? 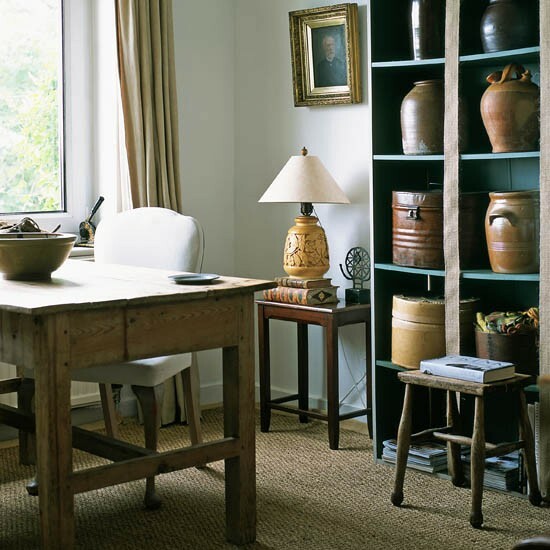 I've always had a sentimental side, and it has been difficult for me to throw things away that have had meaning for me, so I understand my clients who have "things" that they just can't get rid of. 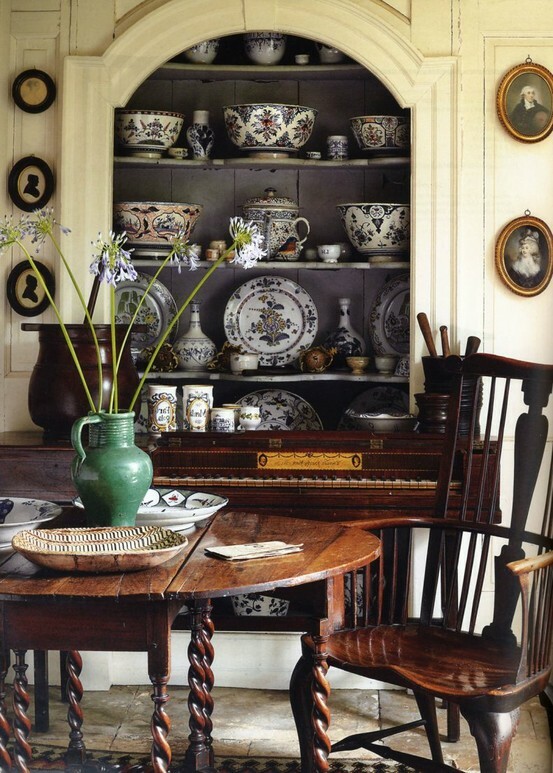 However, collections can be a challenge to creating a pleasing design. So I've had fun seeing how other designers have tackled the issue of multiples. 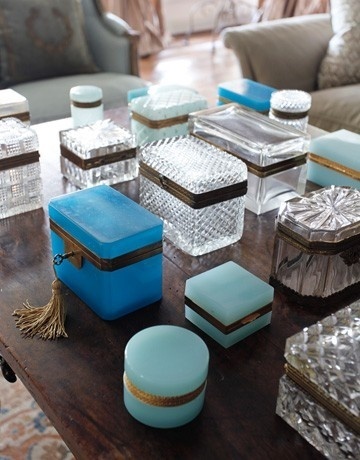 Crystal boxes as a coffee table display are unique and become a great conversation starter! 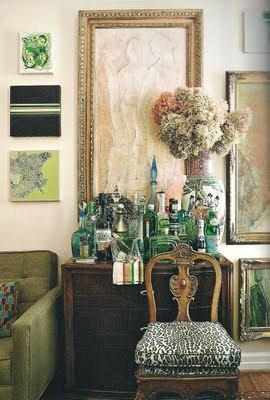 A collection of interesting glass bottles and decanters can be incorporated into a vignette. 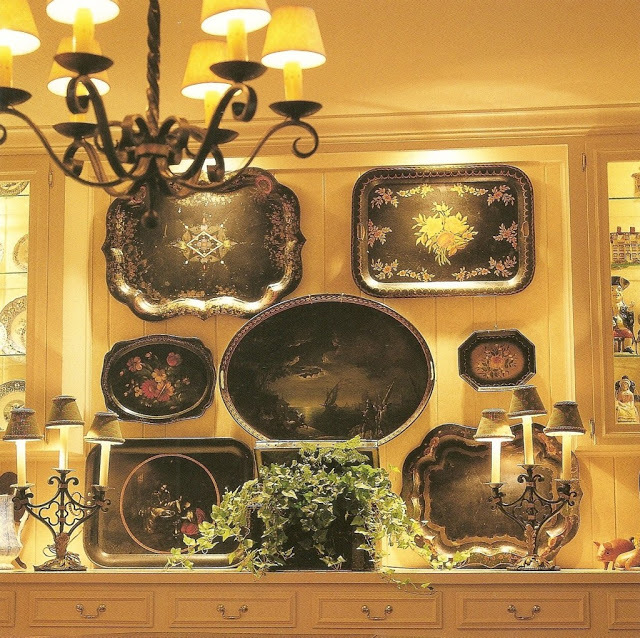 Tole trays are very collectible and their various shapes and colors make them better wall art than serving pieces. 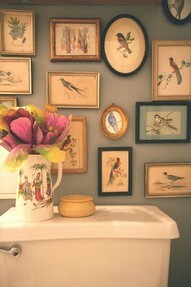 My mother was a bird lover, so I painted many small bird pictures for her over the years, so they now live in a collection similar to this at my house. Maybe you're lucky enough to have a collection of great sunbursts mirrors from the 60's. 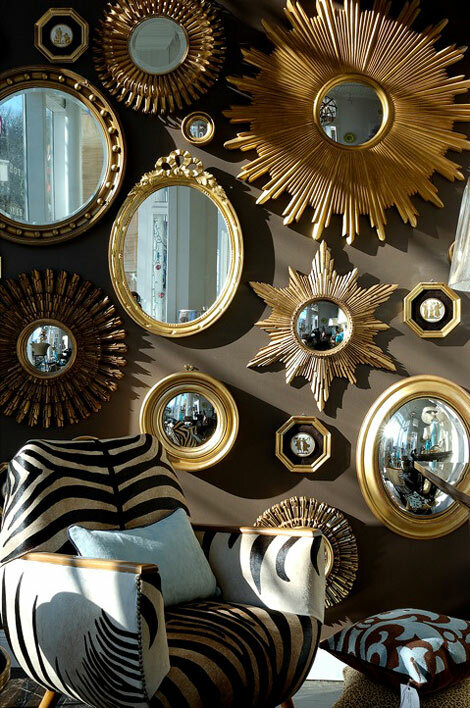 Grouped with other round mirrors and frames gives a wall quite a reflection! 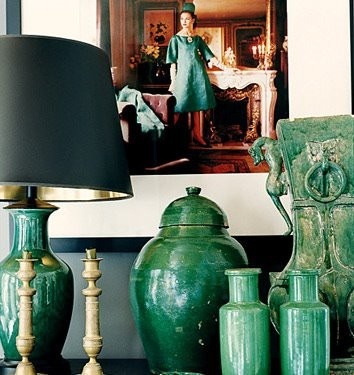 Antiques are widely collected, but I love the way these old urns are displayed in their own antique shelving. Majolica is highly collectible, and it almost requires an antique hutch for display, don't you think? 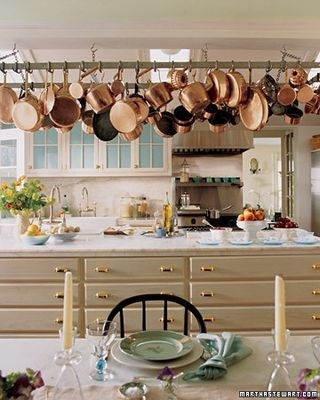 I would die for a collection of copper pots, but I'd need a kitchen this large to display them.....that'd be ok! I've always loved transfer ware, and in black and white, in mass, they make a lovley traditional statement. 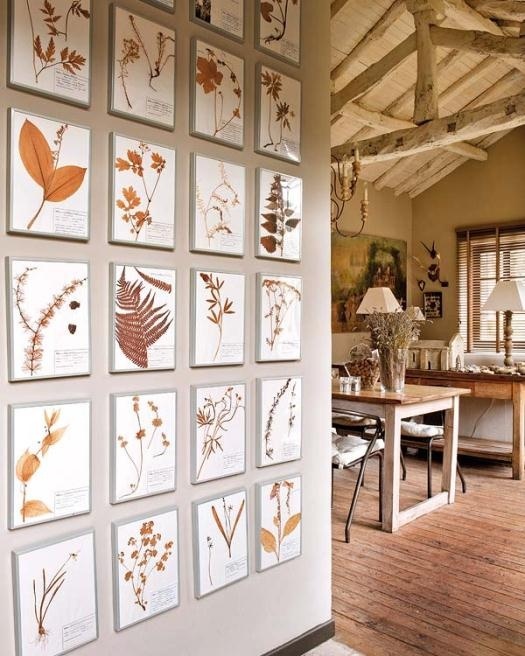 How about a modern approach to the botanical? This looks like a nature project gone artistic. 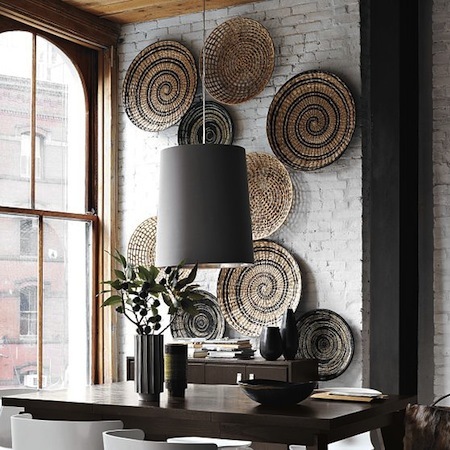 Great way to bring something organic into a space. Hanging baskets on the wall is not a new thought, but when they are as beautiful as these, it's a great way to show them off! 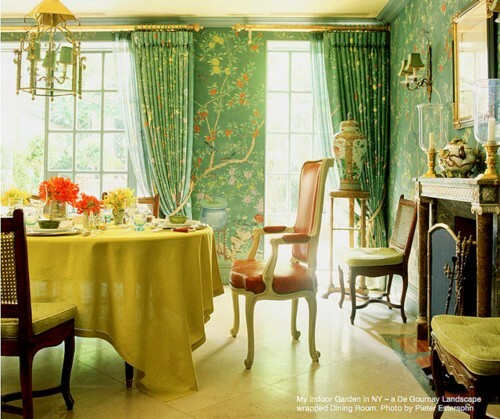 Since turquoise has become such a popular color again (come back 60's! 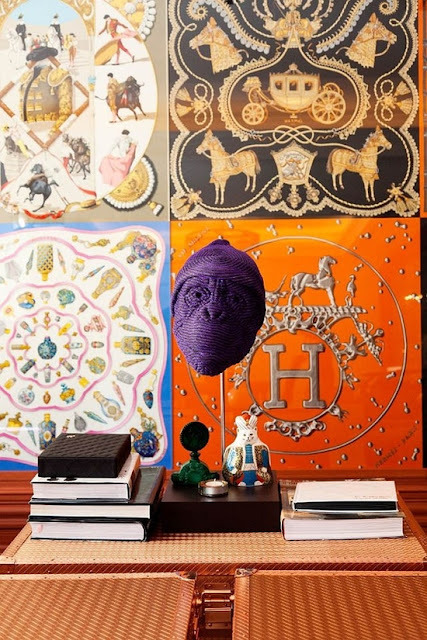 ), globes have also seen a resurgence as a design element. Their color and shape make them a perfect thing to collect. 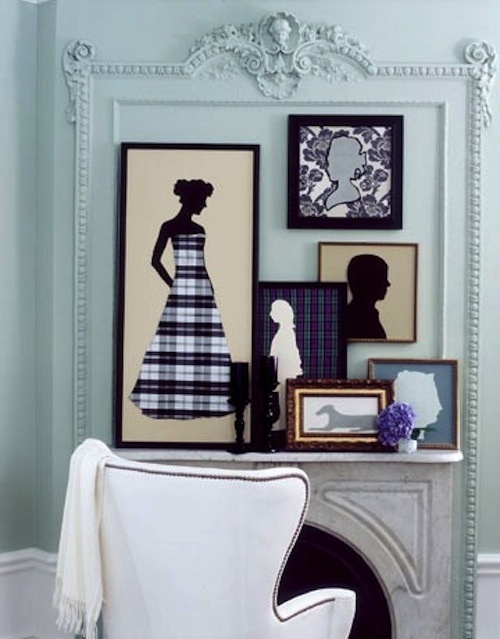 Silhouettes were a staple in everyone's decor when I was growing up, but giving them a modern twist like this takes them out of the attic and back on the wall. 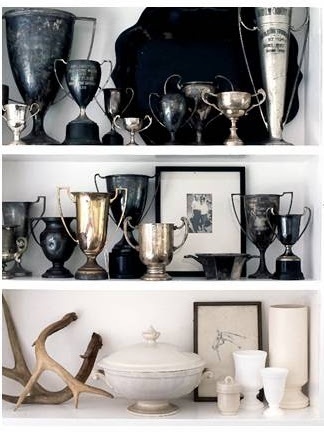 I'd love a collection of silver loving cups! 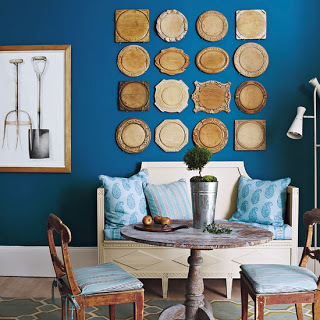 Using old cutting boards as wall art was a new one for me, but I love it! Oh, to have so many Hermes scarves that you can frame them as wall art! 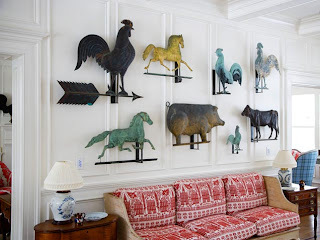 I have always loved old weather vanes, but isn't this a fun way to display them? 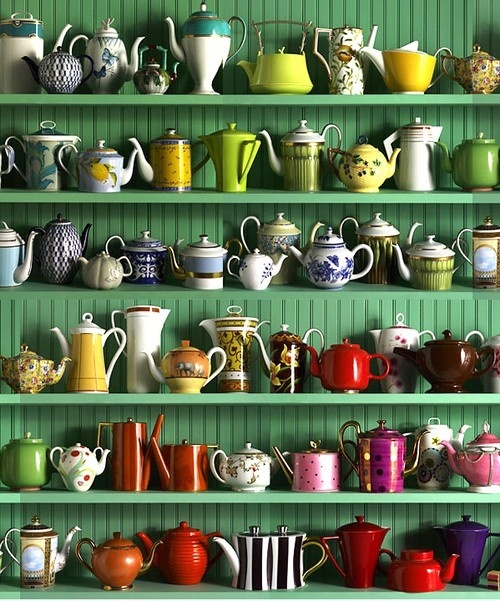 Who knew the humble tea pot could create such art? Displayed in a rainbow is pretty genius if you ask me! 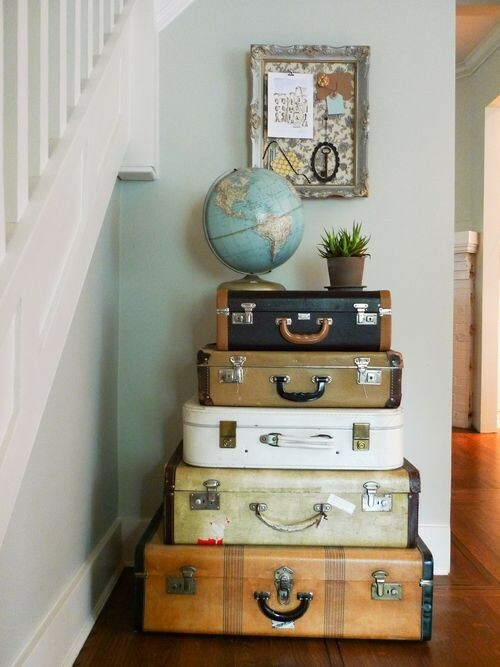 Suitcases as a table? Who knew, but what a great place to show off other collectibles you've gathered! I think I'll draw the line at the duck decoy! The luck of the Irish to ya! I couldn't miss an opportunity to share a bit-o-green with you on this St. Paddy's day. And may you too, find gold at the end of the rainbow! Enjoy your day! So what's a wall to do?